WESTFORD, MA. August 22, 2016 –– Tyco Security Products introduces Kantech EntraPass Go Install, a free mobile application that uses intuitive QR code technology, pre-populated fields and a simplified commissioning process to significantly decrease installation time and lower the total cost of ownership. The application can be associated with other security devices, such as cameras managed by exacqVision, zones managed by DSC PowerSeries Neo intrusion panels and Kantech card readers to provide a Complete Security Solution. 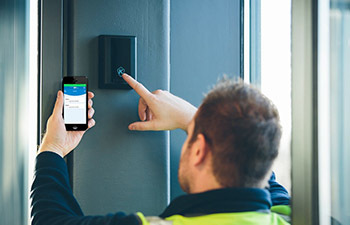 EntraPass Go Install also makes configuration of KT-1 and KT-400 door controllers easier and quicker with app-based test activities that generate commissioning reports once all tests are completed. Test activities include activating buzzers, card swipes and locking/unlocking doors among many others. Once testing is complete, the commissioning report can be saved with corroborating system photos that verify all tests have been passed. The completed commissioning report provides setup verification to system integrators, end users and technicians who support the system so that they know the system has been deployed correctly and limits call backs significantly. The mobile app lets you associate other security devices – Kantech doors, relays, inputs, Exacq video and DSC PowerSeries Neo zones with one-button ease. All of these labor-saving features deliver lower installation costs to customers and quicker installation for integrators. Kantech access control solutions are part of the Security Products business unit of Tyco, the world’s largest pure-play fire protection and security company. Kantech access control technologies are ready to use right out of the box, and provide solutions that are compact, and easy to use for smaller businesses while scaling to meet the needs of larger businesses. Kantech solutions can easily link to Exacq and American Dynamics video systems and DSC Intrusion panels to provide an integrated, holistic security solution. To learn more about Kantech products, visit www.kantech.com.